i was reading a random page on ultra-low-budget-offices on my almost-blazing fully loaded office desktop, when i happened to spot this image in an ad on the sidebar. fortunately, my comp hasn't crashed...yet. i somehow feel like i'm always short of time. maybe it's because i really am. maybe it's because i waste a lot of time doing unnecessary things that don't contribute to my well being. maybe it's because i do the weirdest of things during periods of forced inactivity to make myself feel like i've got no more time left. like today, on my way to work (which i still am, btw...mobile blogging is another thing that i do during my otherwise forced inactivity time), in the rickshaw, i took off my shoes, socks, and nail clipper and proceeded to clip my toenails. i guess i amused a lot of passers-by. anyway, i'm now feeling so good about having made the most of my 30 minute commute to work that i'll probably spend an extra hour reading blogs before i start my work for today. ahh...the story of my life! that's right, i saw my office password for the first time today. and it didn't feel natural at all. funny, the strength of conditioning on the human brain. i'm used to having crazy friends. maybe it's because "birds of a feather flock together". some of the things we say are positively funny when i think about it, but when it happens it's so matter-of-fact. N: "can i call you back? i need to slap my sister." K: "sure, take your time." going out with your teammates at work is fun. it's a welcome break from canteen food (which is passable at best, and positively inedible at worst). plus it feels like a break from office, so when you get back you're as refreshed (or almost-) as when you stepped in in the morning. so this one time, when my team decided to go out for lunch, i jumped at the prospect. we went to inorbit mall, which is right behind my office. lunch was great. we had rajasthani food at rajdhani's, and it was an exquisite experience for the taste buds. next up: dessert. to be more specific, ice cream at gelato's. i had my sights on an italian dark chocolate, in the way i like it best - a waffle cone. the best part is that that ice cream shop doesn't weigh ice creams that are served in a waffle cone (unlike the ones in a cup). i got my ice cream. it looked good. it also looked bigger than everyone else's. excellent! i still eat ice cream the way i used to as a kid. many years ago (few decades ago?) my dad taught me how to eat ice cream. i follow the same technique to this day. according to dad's instructions, ice cream is never to be bitten or sucked, but only licked. and it should be licked in such a way that it gets pushed into the cone, so that for most of the ice cream you're having a combination of ice cream and cone. also, there should be ice cream all the way till the last bite. apparently the rest of my team didn't have such elaborate instructions. 15 minutes later, everyone else was done, and i was still licking away. i decided to speed up a bit. that's when i was rudely reminded of the difference between a waffle cone and a regular cone. so now, everyone had their eyes on me, and i had my eyes on my ice cream. which was trickling out of every orifice of the now-soggy waffle cone. that's when i realised i have just one paper napkin. and it was already wrapped around the cone. and it had already done it's feeble best at slowing down the trickle of choclatey goo onto me. what followed was 5 minutes of sheer "shrinking into the chair hoping the world turns blind or someone unexpectedly kills me" disaster. i only hope no one was secretly filming me. ps: google "embarrass yourself at work". it might surprise you. when i checked my gmail inbox 4 hours later, i almost had a heart attack when i saw 126 new emails. my heart started beating again when i realised they were all bounce notifications for the slew of invites i sent out. i then checked my other email addresses and realised i had invited each of my online avatars too (i have 10+ email addresses at last count). i had also invited all my ex-clients from my freelance web design business. i had invited customer support from all the banks i have accounts with. i had invited customer support from all the isps i had ever used. best of all, i invited my own blog. to twitter. presumably, to tweet. i am not a net addict. i've realised over the past couple of weeks that internet access doesn't mean as much to me now as it used to. i used to be online on messengers for 8 - 10 hours a day. i now sign in about twice a week, and then forget my pc on and go out of the house. i used to recieve about 50 mails daily and read them within 10 hours of them being sent. i now have 2 week old mail lying unread in my inbox. i haven't signed into orkut in 3 days, again up from my usual 8 hours. ditto for facebook. still, the biggest difference for me is not about how little i'm now using the internet, but the fact that i don't miss it at all. in fact, i've got half a mind to just ignore everything other than my email and blog (and maybe twitter) for the rest of the week. going by how i feel right now, i probably won't even notice. and since both my blog and twitter are pretty much unidirectional for me, i don't even think they count as "online". hmmm..forget the half made up mind, let's just do it. most of them are "around" on the net. some tweet, some reply to every blog comment, some comment on my blog, some merely read my comments to approve them. some comment only on blogs of influential people and personally thank their stumblers. there are two people who definitely do neither of the above. seth godin has a blog, which unlike almost all blogs that i've read, has no comments section. no way to communicate with him at all, other than digging/stumbling (which i doubt he checks anyway). and then there's the top of the pile. tim ferriss doesn't even check his email himself. that's right, he's outsourced his e-mail checking to an army of virtual assistants, who actually handle all his personal communication in such a way that he has to only check his mail for under 10 minutes a day. in contrast, i spend an hour checking my office mail every morning (and that's just to catch up with what happened between my leaving the office and getting back the next morning) and another hour checking my personal mail in the evening. i wonder if i should ever go far enough to outsource my email, even if i am as successful as tim ferriss is. if i did, i probably wouldn't have as rich an online community of virtual acquaintances. and somehow, that's about half of what i use the internet for. they can do everything from the cutest to the weirdest things without batting an eyelid. and their sense of innocence is refreshing. so yesterday, i went to church for the 6pm mass. as usual, the church was packed by the time i reached, so i had to be content with standing in the parking lot. which wasn't all that bad really, thanks to the pleasant weather and the fact that i had a pal for company. as usual, there were a few kids running around their parents. there was this one kid who caught my pal and my attention. he was pretty young as kids go (probably around 2 years old) and was livelier than the rest. his liveliness wasn't what caught my attention though. it was the way he interacted with the kids around that did. unfortunately for that kiddo, every attempt he made ended up in pretty much the same way - with the girl running off, crying for her mommy. there was this one girl, slightly older than he was, who apparently wasn't frightened. she started making faces at him. he made faces back. he turned up his collar till it covered his ears. she did the same. he ran up and down the flight of steps separating the graveyard and the parking lot. she did ditto, but faster. kids will always fascinate me. i passed through churchgate station a couple of days ago. not many things seem to have changed since the last time i was there, a few months ago. the biggest change was that the ages-old railway canteen had vacated, and in it's place was a brand new burger joint. and a really cool one too. 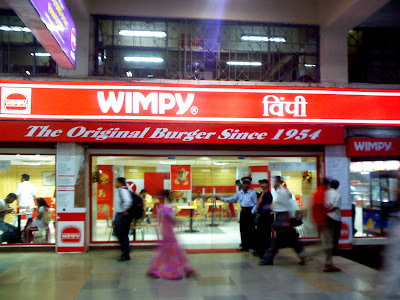 it's called wimpy. that's right. i have photographic proof. btw, while i was clicking that pic, a greying woman actually got over her wimpiness and asked me what i was doing (that too, in the most menacing kind of way). she scared the hell out of me. i almost made a dash into wimpy before i realised i wasn't hungry. i did the wimpier thing and ran out of churchgate station. my sleep patterns change every few years or so. when i was in school, i had to wake up at 6:30am everyday, and if no one woke me at that time, i would wake up by myself at 7 (which was a little critical as far as getting to school was concerned, but i managed). then college happened and everything went topsy-turvy. i have gone through phases of waking up unassisted and right on time, waking up unassisted but slightly late, waking up with multiple alarm clocks going off, having alarm clocks wake up my bro/mom who in turn wake me, etc. the last 3 years have been fairly monotonous though. ever since i brought my n-gage, i started completely depending on it to wake me up. at the same time, i grew almost entirely deaf/immune to it's alarm. the only way i could wake myself at 9am would be to set alarms every 15 minutes from 8am to 9am. if i was extra sleepy, i would set alarms till 9:30 or even 10, just in case (and there have been not-so-rare cases of me sleeping through 2 hours of alarms, auto-snoozed for an hour more, till the battery ran out and left me to wake up 4 hours later...i kid not!!!). on jan 2nd 2008, i got my new phone. the xda zinc. was thrilled by it. still am. its alarm is about 1/5th the volume of the n-gage's alarm. it rings 5 times (which takes 25 seconds, as opposed to the n-gage's 1 minute), and auto-snoozes only thrice (as opposed to the n-gage's 20). it allows me to set only 3 alarms (as opposed to the n-gage's unlimited alarms, of which i would use upto 8). since jan 8th, i've been waking up *before* my phone alarm. sometimes by a margin of upto an hour. i have no clue why. i've switched phones recently, after almost 3 years of literally living out of my n-gage for communication. my new phone, o2's xda zinc, is a real wonder (in my eyes atleast). the touch screen, windows mobile, and the qwerty keypad make for a (unsurprisingly) computer-like experience. however, since it's small and fits in my palm, and it feels like a phone too. for the first time in my life, i'm actually finding myself occasionally confused between user interfaces. at my pc, i wanted to right click on a file, but instead i held the left mouse button while pointing at it, the way i would on my phone...and was surprised when it didn't work out as expected. my first surprise was when nothing happened and the bigger one was when i realised what i just did! on my phone,when wanting to type 0 (which is on the "p" key), i pressed and held the key down (they way i would have on the n-gage), instead of using the "symbol" modifier key. words of wisdom: the more similar two things are, the more confusion they create. I've had the same phone for slightly less than three years. I've used it, misused it, abused it, even done things that it wasn't meant to do. In the course of all these years, i thought i pretty much figured out everything i possibly could have about my trusty n-gage. But then again, i guess all impressions are made to be broken. In the last month i actually learned something new, and it wasn't even arbit. Then i gave it to my bro and he actually figured out two things that i didn't know but would have saved me a lot of time and effort. Holding the "edit" key and pressing backspace converts it into delete - a super time saver when shortening texts to the 160 char limit. When in the menu, hitting a number from 1 to 9 jumps to that item in the menu. When in a list that has mark options, holding "edit" and using the arrows works the exact same way as shift-selecting works on a pc. I guess this only goes to prove that learning never ends. And it never should. it's tuesday night. my blog's last post's footer reads tuesday. i guess that means...a whole week without posts!!! i can't even believe this is happening, considering that i was on a post-a-day in november and pretty damn close to that in december. to be fair, i've been busy. work started picking up, and suddenly "work-life-balance" has started to mean taking 15 a minute break to call someone when my manager's not around. on top of that, i've got better things to occupy myself with besides work. that's right. new phone. it's every bit as mind blowing as it looked and sounded. true, noting perfect, but with this one, the possibilities are endless. more on that later. true to my resolution, i've started maintaining a personal diary. untrue to my resolution, i've only written in it twice. true to my resolution, i started walking. did it for exactly 2 days. true to my resolution, i started exercising too. did it for exactly 1 day. i broke the drinking resolution in the first couple of days of 2008 itself...so that wasn't even a contest. come to think of it, i haven't kept any of my resolutions. i guess it's back to regular non-new-year-resolution-style living for the rest of 2008. not that the past week was any different...but it's the thought that counts, no? i'll be back with new resolutions next year.